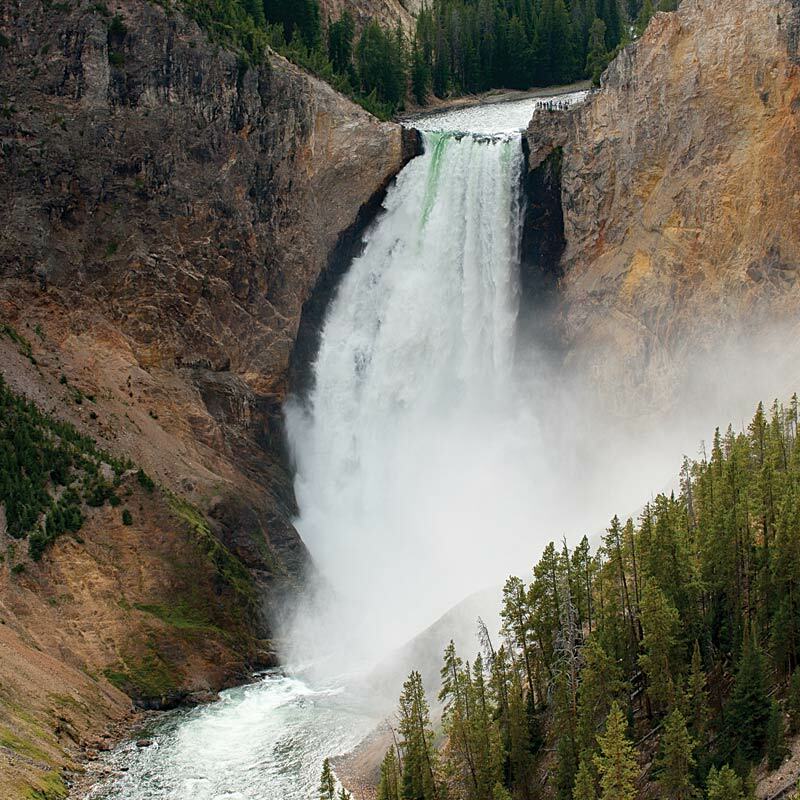 Yellowstone National Park – Riding a tour boat around giant Lake Yellowstone and marveling at the mountain vistas that surround the lake on every side is one the those special moments that will last a lifetime of memories. For anglers, fly-fishing for cutthroat trout on crystal clear white water streams and getting a strike is equally memorable. But these are only samples of the wonders of Yellowstone. Seeing Old Faithful roar into the sky almost every hour on the hour or viewing the Grand Canyon of the Yellowstone and its magnificent falls at sunset are one-of-a-kind sights that take your breath away. Pompeys Pillar National Monument – east of Billings via I-94 – Captain William Clark and a contingent from the Lewis and Clark Corps of Discovery explored Yellowstone River country on the return journey from the Pacific Ocean in 1806. Captain Lewis’ group explored the Marias River near today’s Glacier National Park, then headed down the Missouri River in dugout canoes to meet up with Clark’s group at the confluence of the Missouri and Yellowstone Rivers. Three of Clark’s men herded the horses along the river while the rest rode the river in dugouts. Sacajawea and her infant son were in Clark’s dugout. They camped at the base of a huge sandstone escarpment where generations of prehistoric Indians had camped and carved illustrative figures in the soft sandstone. Clark was intrigued by the site and climbed to its summit to view the river and surrounding landscape. He was so impressed with the site that he carved his name at the base…. Today’s travelers are amazed that his signature has survived and can still be seen. It is the only physical record of Lewis and Clark’s journey that remains along the entire Lewis and Clark National Historic Trail. Along the Yellowstone River in Billings is the site where Clark ordered his men to drive the horse herds across the river and proceed to the rendezvous site at the Missouri River. Billings has marked the site and will develop it as a focal point of a trail that connects with other parks and scenic vistas. Billings is Montana’s Trailhead City. The community offers open space and a western pace with the beauty and grandeur of Yellowstone National Park and the scenic Beartooth Highway. There is history right outside your hotel window with the Custer’s Last Stand and the Lewis and Clark Expedition nearby. 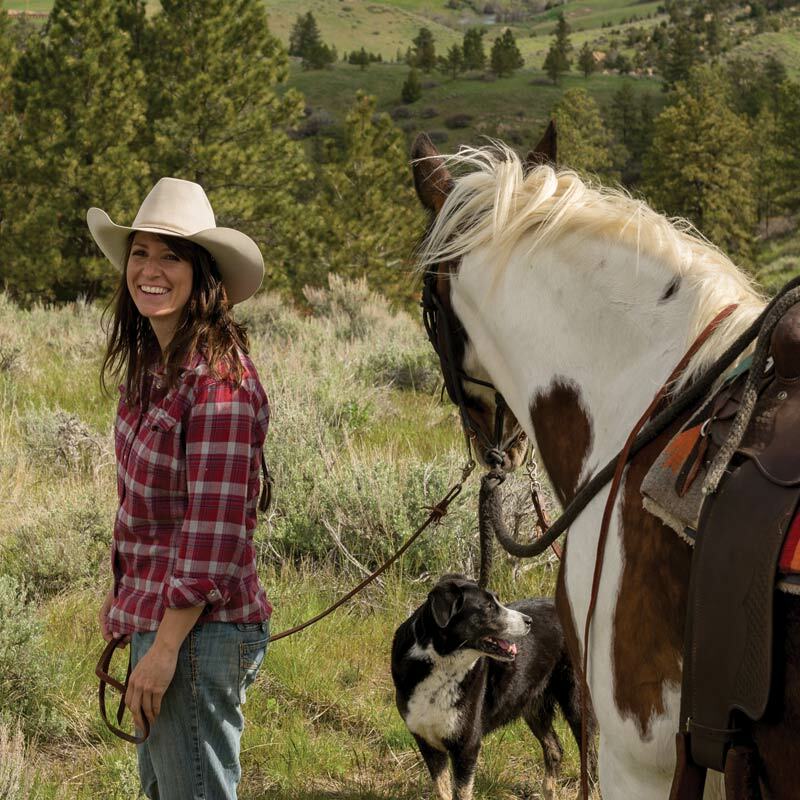 You can take in fly fishing and horseback riding, to walking the city’s trails along the sandstone Rimrocks, or the Historic Walking Brewery Tour, you will appreciate the experiences and memories made for a lifetime to come. The Western Heritage Center offers changing and interactive exhibits showcasing their extensive collection that documents the colorful history of the Yellowstone River Valley. Yellowstone Art Museum features both Wild West nostalgia and contemporary artists. Yellowstone County Museum was organized in 1953 and sits atop the rims at Logan International Airport overlooking the city of Billings and the scenic Yellowstone River Valley. Entrance to the more than 15,000 artifacts representing the area’s history is through a pioneer log cabin. The museum is free of charge and open 11 months of the year. ZooMontana is the region’s only Association of Zoos and Aquariums (AZA) accredited zoo. With over 70-acres, the zoo is home to both native and non-native species, specializing in northern-latitude animals. Visitors can admire animals in a natural setting, housed in state-of-the-art exhibits. Visitors can also enjoy the Sensory Garden, one of many botanical gardens located at ZooMontana. Pictograph State Park is 5 miles south of Billings. This National Historic Landmark features trails lead-ing to three caves where prehistoric paintings can be seen. 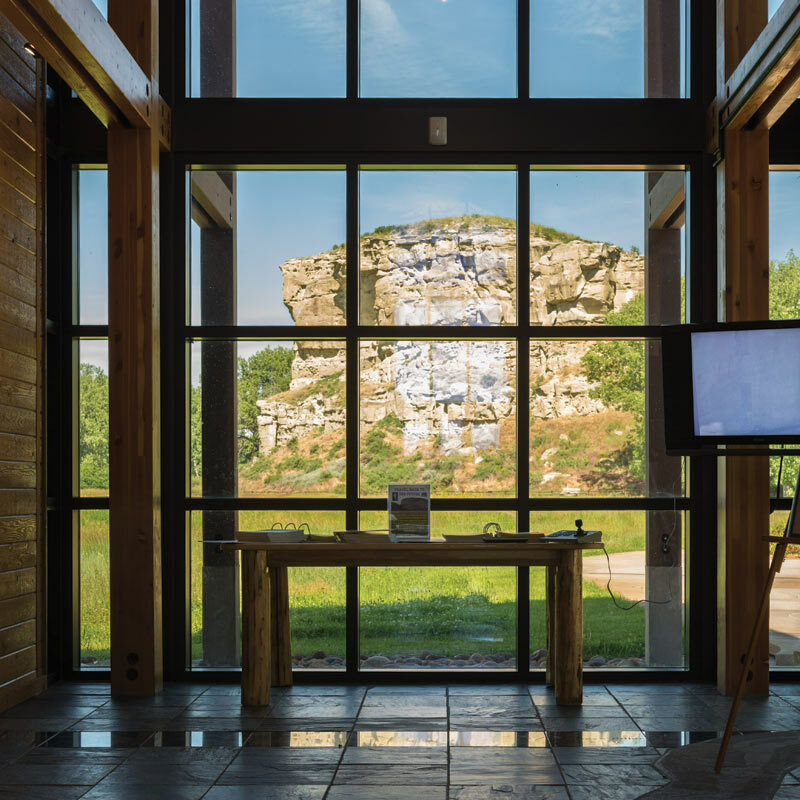 Visitors should check out the interpretive center for better understanding of the rock art, and allow at least an hour to complete the 1/4-mile loop tour. Swords Rimrock Park features historic sites, scenic drives and jogging trails on the Billings Rimrocks near the international airport. It is home to Yellowstone Kelly Gravesite. Luther Sage (Yellowstone) Kelly was one of the most notable American veterans, scouts, and warriors of his time. Born to an affluent family in upstate New York, Kelly obtained a fine education, but yearned for the adventure of the Wild West. In his twilight years, he requested to have his body buried in the land where his restless spirit had experienced its greatest adventures. Montana Audubon Center is adjacent to the Yellowstone River and features trails and nature programs. Moss Mansion Historic House is a turn-of-the-20th century mansion listed on the National Register of Historic Places. Montana’s Pro Rodeo Hall and Wall of Fame was established to recognize Montana’s cowboys and cowgirls who have achieved national recognition in the sport of rodeo. Where the Beartooth All-American route begins. The scenic Alpine Town includes Yellowstone Wildlife Sanctuary, the Carbon County Museum and the Red Lodge Mountain Resort. The Beartooth scenic route crosses rugged mountain vistas to the Northeast Silver Gate entrance to Yellowstone. where visitors can enjoy the Crazy Mountain Museum and Greycliff Prairie Dog Town State Park and continues West to Livingston before driving South to Gardiner or US 89 and the North entrance to Yellowstone. Livingston features the Yellowstone Gateway Museum, the Livingston Depot, the Main Street Historic District and the Fishers Fishing Discovery Center. 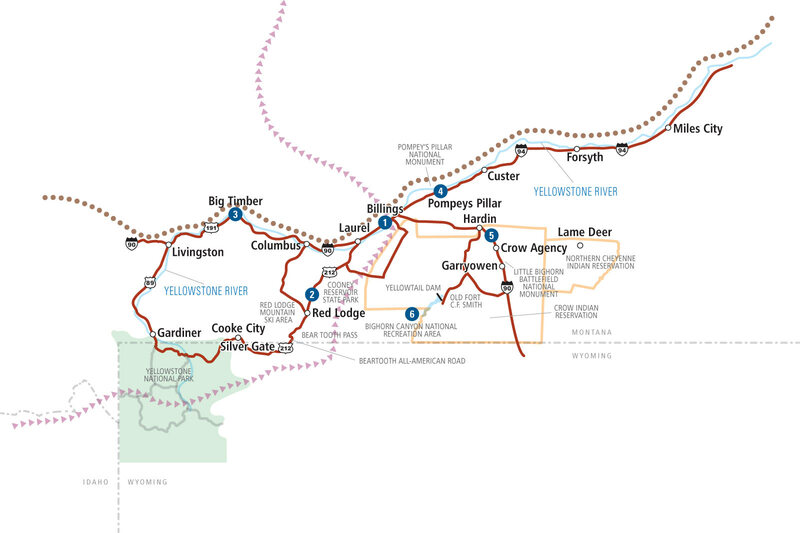 Gardiner includes the Yellowstone National Park Heritage Center and historic Roosevelt Arch. This site holds the only visible remaining physical evidence of Captain William Clark’s return journey through Montana. Clark Days are celebrated every July with a variety of events and presentations. Miles City – On I-94. En route travelers on I-94 will have a great time in this Cowboy Community identified in “Lonesome Dove.” They’ll see the Range Riders Museum, a 1900’s-era saloon, art galleries and activities that focus on Montana’s cowboy heritage. Miles City’s famed Bucking Horse Sale and Rodeo attracts thousands of Rodeo fans every May. Hardin – The Little Bighorn Days and Custer’s Last Stand re-enactments take place in Hardin each June. Garryowen – A registered historic site, Garryowen, the only town within the Battlefield is located at I-90 Exit 514 just south of the Little Bighorn Battlefield National Monument and Custer National Cemetery. The Custer Battlefield Museum houses extensive new exhibits including hundreds of Custer Battlefield artifacts from the Battle of the Little Bighorn and the Plains Indian War period. The Real Bird re-enactment at Garryowen, just east of the Little Bighorn Battlefield National Monument, portrays the event from the Native American perspective. Crow Indian Reservation – Home to the Crow Nation and Crow Agency, its Tribal Capitol, is at the junction of US 212 and I-90. This area is known the world over as the site of the Little Bighorn Battlefield National Monument. The museum, interpretive trail and markers of the fallen bring the battle into sharp focus. 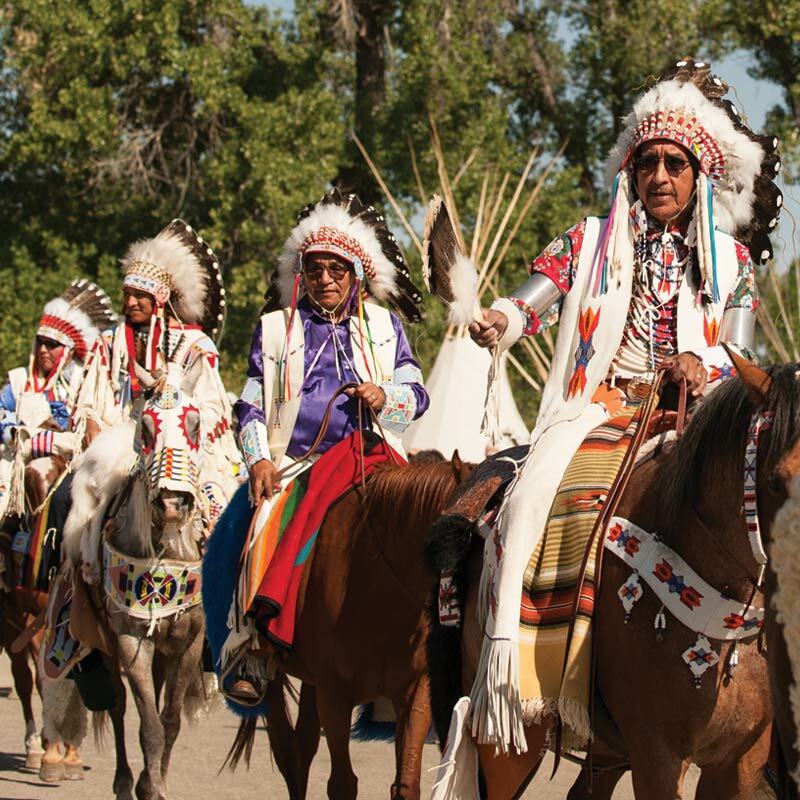 The Crow Fair and Rodeo staged each August is the largest native American encampment in the U.S.
Northern Cheyenne Indian Reservation – Home to the Northern Cheyenne Nation and its Tribal Capitol of Lame Deer, on US 212, includes the Northern Cheyenne Crafts Center. Via MT 313, south of Hardin to Fort Smith, offers spectacular views and great boating, fishing and camping. Two developed visitor centers and facilities available near Fort Smith. Chief Plenty of Coups State Park – Discover the history of the Apsáalooke people’s last traditional tribal chief with an informative visitor’s center and a 1/2 mile walk of the grounds. Visit Chief Plenty Coups’ home and learn about native Apsáalooke culture, history and legacy. I-90, exit 447 at Pryor.